Home > Uncategorized > Today Only – Save On Cross Pens – Now From Only $10.75 + Free Shipping From Amazon! December 6, 2018 Comments Off on Today Only – Save On Cross Pens – Now From Only $10.75 + Free Shipping From Amazon! 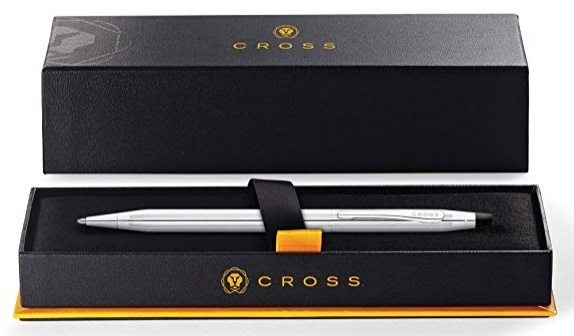 As one of today’s Amazon Deals of the Day save on select Cross Pens! • Cross Classic Century Satin Chrome Ballpoint Pen (AT0082-14) – Only $10.75 + Free shipping! • Cross Calais Chrome Blue Ballpoint Pen in Gift Box (AT0112-3) – Only $13.49 + Free shipping! • Cross Classic Century Lustrous Chrome Ballpoint Pen (3502) – Only $15.03 + Free shipping! • Cross Bailey Red Lacquer Ballpoint Pen (AT0452-8) – Only $15.74 + Free shipping!